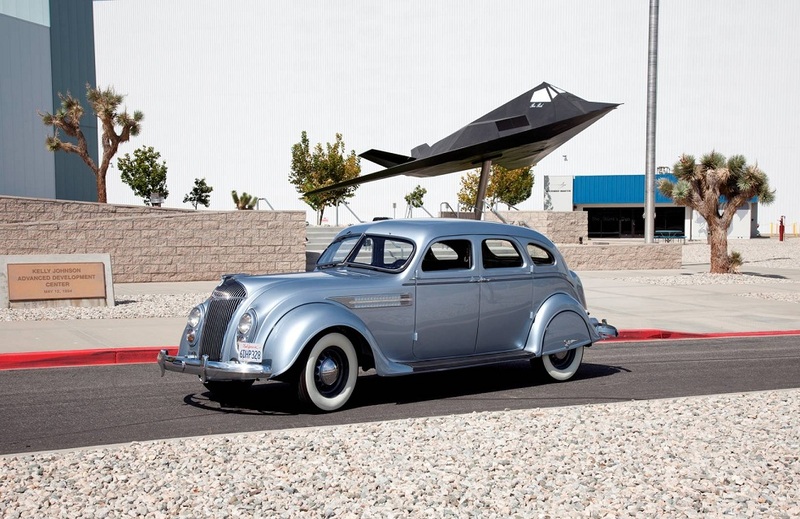 Shown for the first time October, 2012 at the Lockheed Martin Skunk Works in Palmdale, CA. At a Car show as part of the Annual Employee Day. 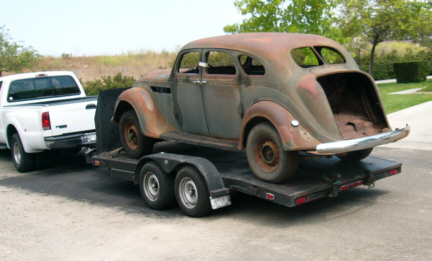 25 Jan Car moved to Art Foster's engine shop in Santa Maria for removal. Art's been in the area for over thirty years and has a local legacy in racing and a reputation for meticulous work. He supplied race cars for the 1960s race culture film Heart Like a Wheel. It's great to have him working on this engine. 29 Jan Engine disassembled; this thing is BIG Was about half a quart low on oil - didn't look bad either for being from 1951. Blown head gasket found, and thermostat was rusted/frozen open all the way. 07 Feb Block sent next door to Mid State Machine shop Magnaflux found no cracks. Engine found to be in excellent condition - perfect for Restoration. 14 Feb Generator & Starter taken to Century Electric here in Santa Maria for overhaul and conversion to 12V. Completed 19 March. 19 Mar Radiator cleaned out and repainted here in Santa Maria. Left: Newly cleaned and reassembled transmission. Note small tag with date of 11-15-35. 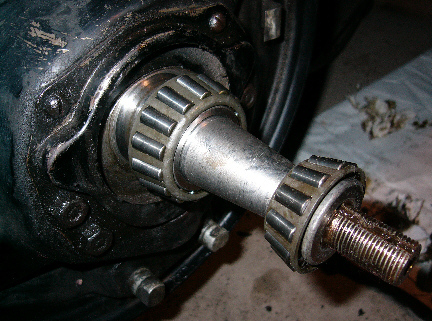 Below; Interior of OD gears. No damage at all. Cleaned and reassembled. 12 May Every time I hammer on the car, the dashboard clock starts ticking again. 13 May Front Seat removed. What a PAIN that was! If the wooden floor panels hadn't been so crispy, it would never have come out. Ended up just yanking it out of place. 20 May Vacuum Advance received back from rebuild by Terrill Machine in Texas. 11 June Got second rear quarter vent window open for the first time in 55 years. Both now work perfectly fine. The rubber was rock hard and had bound the windows closed, it broke away in chunks. Removed speedometer, more wooden floor panels, wiring harnesses, cables, interior firewall padding, interior pillar 'rope' tack strip, and firewall penetration gaskets. 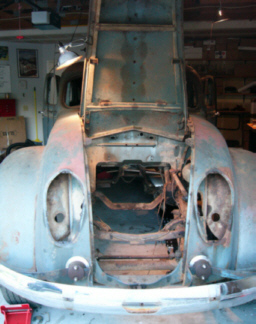 Removed horns, regulators, wiring harnesses, brake & speedometer & ignition switch cables, inner splash fender (L side), front bumper guards, headlight assemblies, and a number of bolts previously rusted in place. Continuing to find dozens of walnut half shells, and the occasional complete one. The dense cluster of cables behind the gauges is odd; several kinds of cables connected to one dash instrument; oil pressure tube, electric cable, heat tube; its a mess to work in. 05 July Removing wooden floor panels. Found the floor rails inside the doors to be rusted enough to warrant replacement. 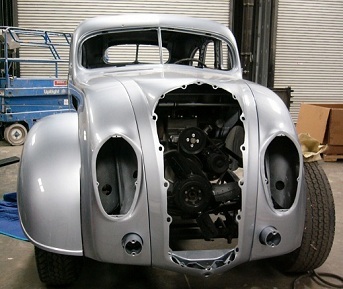 Bumpers and guards delivered to plating shop near LA for rechroming. Gas tank has also been removed - it's full of gunk and quite heavy. The gasoline had turned into a solid brick of black goo, and had to be boiled out twice here in Santa Maria. The weight of the mass had broken the internal baffles loose, so they had to be reattached back into place. The mounting screws were soldered back over, and the entire thing coated and given a lifetime warranty. 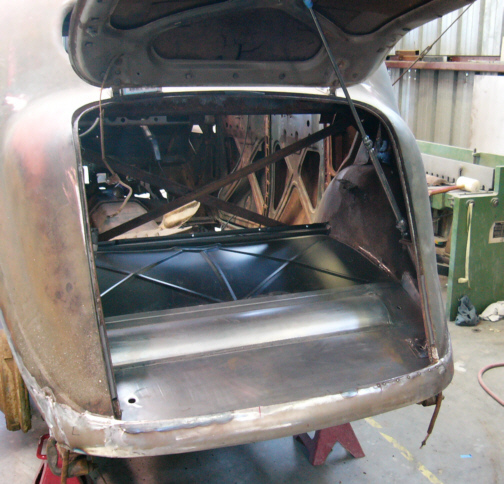 Trunk floorpan reproduced and is being installed. Rear body panel below trunk lid also reproduced. 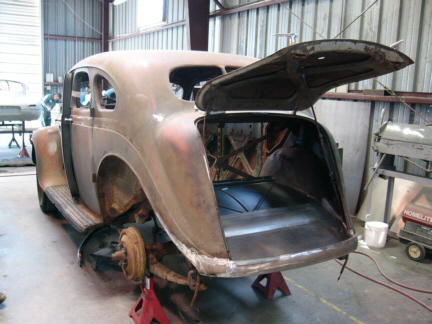 Doors and rear fenders are off it now for the first time since March, 1936. 30 August Car returned from media blaster today. Interior cleaned up very nicely, some perforation rust found in front of one rear wheel well. Running boards removed, and attachment points are 'okay', but will be replaced now. New trunkpan welded in, and new drip rail around inside deck lid opening is completed. Trunklid has been tweaked to fit just right. Moving on to floor board insert rail replacement and windshield area. 29 Jan 2007 Door sills and running board attachment rusted areas have been replaced. Entire vehicle now epoxy primered. 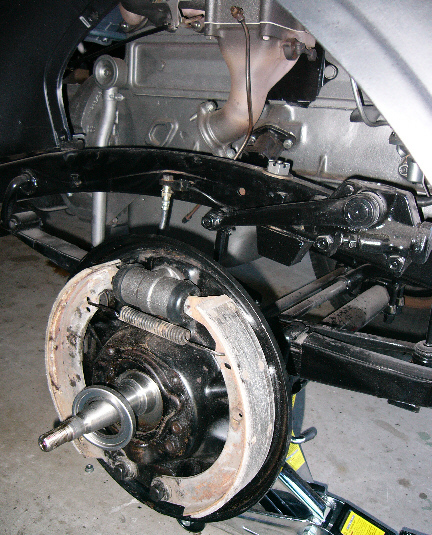 Undercarriage and frame have been media blasted and painted with black frame paint. Rusted area under back seat has been replaced and primered. SUCCESS ! Major Milestone Met, as Straight 8 engine #2253 was fired up on test stand for the first time in 56 years. It is solid, quiet, and with no vibration. Looks like all the effort and expense has paid off. Engine has been balanced (with bell housing on) and blueprinted. This is now one NICE piece of machinery, better than when it left the factory. Original NOS pistons and rings, straight from their 1930's parafin sealed boxes, brought it back to life. Original starter (rebuilt to 12V), original fuel pump (rebuilt to E85), original water pump (rebuilt w/modern bearing), original carbeurator (overhauled), original fuel & vacuum metal lines, original manifolds, original cylinder head, original distributer (converted to elec ign), original electric choke, original vacuum advance (rebuilt), original air filter, original heat shields, original harmonic dampener, original camshaft, original crankshaft (balanced), original oil pan and original oil pump. Vintage NOS oil filter, vintage NOS autolite distributer cap, vintage NOS carb gaskets and vintage NOS thermostat. The only 'new' things are internal high precision bearings, hard valve seats, valves, timing chain, gaskets & seals, spark plugs & wires, oil lines to/from filter, freeze plugs, water hoses, the fuel-pump-to-gas-line rubber tube, and of course the visible brass fitting on the thermostat housing (which is temporary). I had made a section of stainless water pipe for the radiator to replace the original. After nine months at the body shop in San Luis Obispo, the 9 leaves to come home. All rust removed and/or replaced, trunk floorpan replaced, roof insert panel repaired (given new mounting surfaces and holes fixed), rocker panels replaced, chassis media blasted and painted chassis black, entire body media blasted and epoxy primered, AND fender skirts. The engine has been reinstalled into the car - the front sits a lot lower now. Had to buy a pair of larger size fender skirts and have them modified to fit the C9. Expensive for sure, but the only real chance I had for getting 1936-only C9 skirts. 4 June 2007 Reassembly has started. Reinstalled the acclerator linkage, horns, firewall pass through grommets & housings, new cowl vent drain lines, metal kick panels, wood inside the side windshield posts, simple things that can go back in, since the engine bay's painted. I also special ordered a custom exhaust system, complete with an original size single chamber, oval muffler over 40 inches long. John Spinks of Australia used my bits and pieces of dash switches and rebuilt a new set for me, in exchange for letting him have extras I'd come up with over the years. Great trade off and we both got sets of working switches. I got the floor panels sections cut to fit. I used 5/8" marine grade plywood, and the panels fit very well. Its starting to look like an interior again. I have painted the panels black and the bottom (exterior) surfaces coated with polyurethane. I have also remounted the battery box and its associated hardware, cut out the holes around the pedals. Paul Anway fabricated the pair of long carriage bolts that go the length of the battery box. The gas tank repair was done here in Santa Maria and is complete, and it's been painted. I had the sending unit refurb'd and its installed as well. Had to make a new gasket out of cork. It appears someone did a lot of brake work in 1951 before parking the thing. Better for me though. I did replace the cylinders with new ones from NAPA (Yes they are still available!). Master cylinder was replaced with an overhauled one, and the power boost unit removed to be sent for refurb. 10 Aug 2007 Fuel tank has been reinstalled. Old fuel lines removed and new ones installed. I plan to reuse the old ones, but it will take a LOT of cleaning, as they are full of thick stringy black Goo. 12 Aug 2007 I've been cleaning a lot of the original bolts to reuse, the ones with the DPDC logo on the top. Soaking them in mineral spirits for a couple of days did wonders for returning them to New look. 15 Aug 2007 Rechroming of the shifter and under dash handles are complete. Exhaust system installed. I couldn't believe the quality. The stainless strips are still in place and look practically new. And they fit perfect. I didn't know what to do about the old ones if I hadn't gotten these. The car really pops now. Aug 2008 Overhauling dash gauges. I'll end up sending them out for refurb, but I wanted to get them started. Received back the temp gauge from Arkansas which needed the temp sensor reattached. Looks good. Aug 2008 Seats being reupholstered and rebuilt here in Santa Maria by Amos Herrera . The original fabric was not available of course, so I went with a modern fabric which does closely mimick the original wavy weave. A note about the interior. The original fabric was very distinctive, but was completely shot by the time I got the car. I put a lot of thought into how to do it, but couldn't bring myself to do a plain broadcloth with a lack of pattern so far from the original. I ended up finding a fabric which contains a wavy, zig zag pattern reminiscent of the pattern in the original. The color and texture are different, but from five feet away, both fabrics show a similar zig zag pattern to the eye. It doesn't show up well in the photos, but it's there. I felt it better to get closer to the weave pattern than trying to match original color. 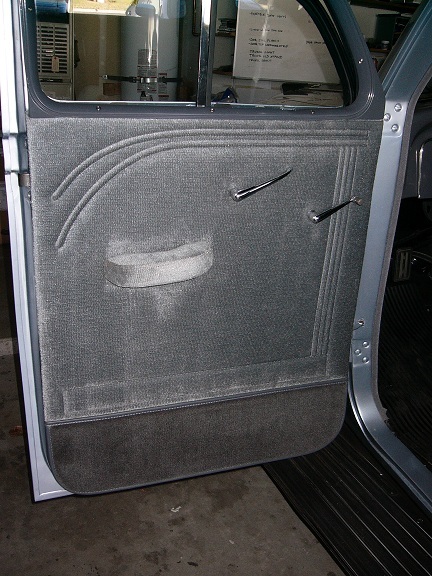 I am putting a lot of effort into recreating the exact stitching patterns on the door panels, and I mean exact, width, length, and height/thickness of the shapes. The only thing different is the color and the knap of the fabric. THEN A WHOLE YEAR GOES BY - IN THE SHOP. What should have taken 6-8 weeks for final sanding and prep and painting, ended up taking 14 months. They had guys quit. There were weeks at a time when it wasn't touched. Drove me crazy. For months. Never seen anything like it. In the meantime, I started on the interior. Work progressed on the seats. Amos Herrera of Santa Maria disassembled the seats and is doing the interior. I rebuilt and repainted the wooden frames. We were able to reuse most of the seat springs, but did have to by a number of replacements. Ended up buying a replacement seat spring assembly intended for a 1936 four door Ford sedan and took it apart to get a few correct size coils. 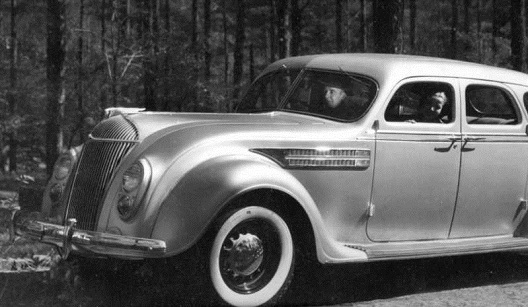 Chrysler had a lot more different sizes of springs in the seat, but the ones that had to be replaced were fortunately the same sizes as those in the Ford seat. Lucky! It took a while to get the front seat adjustment mechanism back into working condition. I had to get new feet scratchbuilt for it to make sure it's strong enough. But's together again now and works fine. Bought black fender welting. I'm going to leave it black. Bought three point seat belts - but will have to see if they can be installed all around or just in back. Had the fuel filler neck plated in copper, like the original, and got new steel braid to install as a grounding strap (just like the original). John Spinks of Australia, was kind enough to fabricate a new shifter shaft rivet which keeps the spring assembly in place. I'd tried to have one made locally, but they couldn't seem to make it happen. Many thanks to John for bailing me out once again! Car is PAINTED. 2001 Aston Martin Solent silver. I wondered if I would ever actually see this happen. There were times I'd look at it and wonder if it would ever be anything but rusty. It's back home again, this time for good. 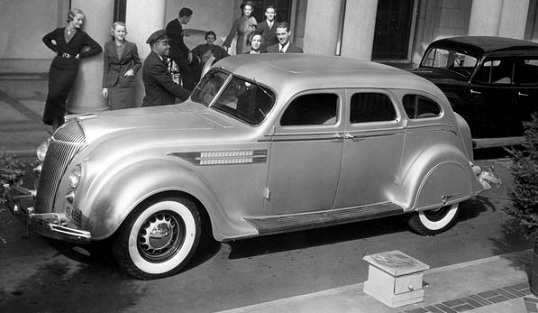 Here's a couple of vintage Chrysler factory photos showing 1936 Airflows, and the paint has got to be silver. So, I'm thinking my color is just not that far off. Sept 2009 Installing new wood floor panels. Using neoprene to cushion and seal the panels in the frame. It's looking very nice. Running short of floor panel screw shoulder washers. Once again, John Spinks of Australia came to the rescue by fabricating the spring steel clips that keep the tailight lenses in place. Mine were useless, and there is no supplier for them. THANKS AGAIN John! Bought replacement window glass for the rear windows and rear quarter windows. Am able to get 1/4" safety glass just like the original. Sept 2009 I've learned a new Law of the Universe. 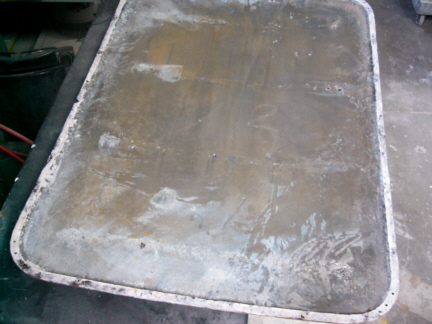 Any part removed from an old car prior to refurbishment, will not fit upon reinstall. Unbelievable. and not just from paint thickness reducing diameters of holes, either. Spacing of holes is impacted by reassembly sequence of fenders and parts. 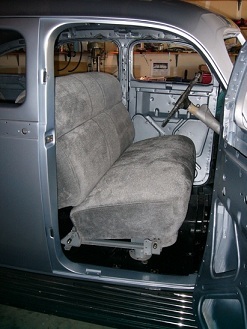 Seats reinstalled for check fit prior to installation. I was able to get replacement rear quarter window frames and assemblies from Chuck Cochran. With the new glass now, this is a major hurdle bypassed. I have been buying whatever floor panel screw shoulder washers I can - I might be short on them. Since I'm wanting to keep it original as possible, I'm using only correct components. I even bought used bolt lots off ebay to get more bolts with DPCD heads. 22 Dec 2009 Differential has been cleaned out and refurbished. The grease in there had been there since Hitler was in power, and was like peanut butter. Rear Brakes done. Tim Anderson flew out and spent a week working on it. He took care of the differential work and brakes. The front brake cylinders were available from NAPA, but not the rear. Luckily, we were able to reuse them, refurbishing them with kits I got from Argentina of all places. We'd had trouble before, getting the rear hubs off to get at the brakes; couldn't get it to budge. I even bought a special made hub puller for Airflows, but turns out it didn't fit, the hole pattern radius was not big enough. It had to be modified by elongating the slots and then it could work. Shifter reinstalled, along with the Drive shaft. Engine run in the car for the first time since 1951. Rear shocks removed for refurb. Door handles sent out for chroming. 15 Jan 2010 Wiring harnesses are going back in. Starting on the overhead windshield hinges. Starting on the door windows. Got the fuel filler neck grounding strap soldered on and the assembly reinstalled. 15 Feb 2010 Sent the rear shocks to LA to be rebuilt, and the gauges to Portland to be refurbished. Starting on the door windows. Took the rear tires off and delivered the wheels to the powdercoating shop, along with the spare. I'm going to have them dark gray to match the dashboard, with the factory pattern sunburst reapplied. 28 Feb 2010 Disassembled the two windshields in order to take the frames to be powdercoated. The originals were completely unusable, and so I got two nice replacements from Phil Putnam. They disassembled fairly easily (with previous How-To instructions from John Spinks) and should clean up well. 24 Mar 2010 Turns out the two windshields frames can't be powdercoated after all because of the perforation that showed up during bead blasting. They'll take some restoration with metal-to-metal and have to be painted. Oh well. The wheels, however, are turning out very well, powdercoated in dark gray. 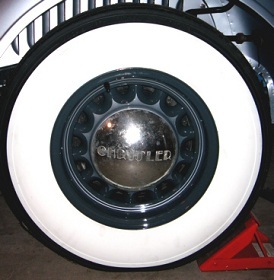 I've also gotten new shoes for the thing; new tires for all four wheels, 7x16 bias ply with 4.5" whitewalls. This thing's gonna POP! The old tires have been demounted from the wheels. The wheels were taken to Santa Maria Powdercoating, baked and cleaned up, then coated the same dark gray color as the dash. The factory sunburst pattern and dual pinstripes on the original wheels have been duplicated and turned out pretty well. 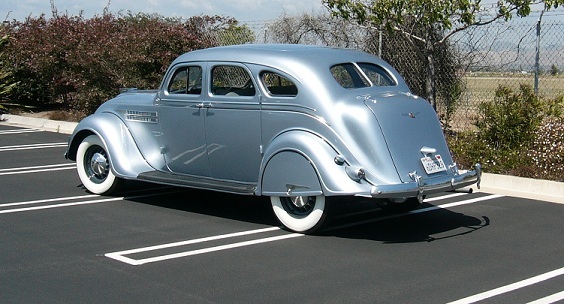 The sunburst is the same silver as the body color. I'm pretty happy with the way they're turning out. The overall effect is conservative, but at the same time, I hope striking. The thing is starting to show its Art Deco roots. 04 April 2010 Spent the weekend applying Dynamat to the bare interior surfaces to minimize vibration and help cool it a bit. I plan to add Dynapad as well to better help with temperature. Oct 2010 Got the stainless trim attached to the fender skirts, and the running board side trims put back on. Nov-Feb Work suspended on the car while I was working in Colorado TDY. 26 Feb 2011 Got the front passenger window assembly put back together and installed. Something about windows in a car shell that turn it into an actual car. 19 Mar 2011 Got the last of the wiring harnesses permanently installed. I'd gotten them from Rhode Island wiring in 2007 and they fit like a glove. Finally got the headlight assemblies reassembled and installed. Turn signal visible through the horn grilles. 06 April 2011 Installed a new, pristine NOS trunk handle I got off ebay for $19. Sometimes you can get a real bargain on ebay. Had the lock transferred over. 10 April 2011 Tim Anderson showed up to begin the final rush to completion. After four years, the end is finally in sight. 20 April 2011 Completed installation of a new fuse box into the wiring under the dash. Given the sparsity with which things were fused back then, it seemed prudent to install a new bank of fuses. Also added a 12V accessory port under the dash for plugging things in. Brake light switch changed out again. 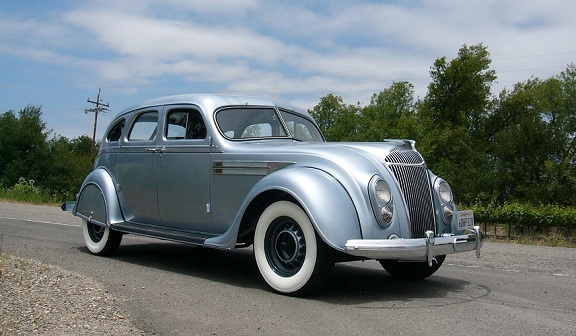 NOS switches keeps failing - then I found out NAPA stocks new ones for a 1936 Chrysler Airflow. Bingo. 5 May 2011 Bought a steering wheel restoration kit from Eastwood, and used it to restore the old three spoke wheel. The kit is great, works like advertised. Took it to the body shop for black paint and clear coat. Looks pretty darn good, especially considering its previous state. 6 May 2011 "I think we're done". Had some trouble with the automatic choke, though - something not quite right. I ended up putting the original choke back on, with the same dropping resistor, and all problems related to that simply ceased. The original is back on and its working fine. 11 May 2011 I've driven the thing around the local neighborhood a number of times, checking things out. But, I'm only now ready to take it away from the safety of the garage out on the highway. On the second venture out into the real world, drove 32 miles through California central coast wine country. Stopped at a gas station for the first time in 61 years. Drove the thing to work for the first time. Got great response from people who'd had to hear about it over the last four years. The car handles just fine in city (ok..town..) traffic. The thing really POPS in full sun! Buffed up the wheel covers and, while old, look decent enough. Laid down a rubber mat in the front floorboard to help dampen noise until the carpet and pad goes in. 23 June 2011 Had the lifters adjusted and that quieted the engine noise down quite a bit. I also had the exhaust system reconfigured a bit, to better align with its intended attach points, and has the 'bologna slice' cut put on the end of the tailpipe. 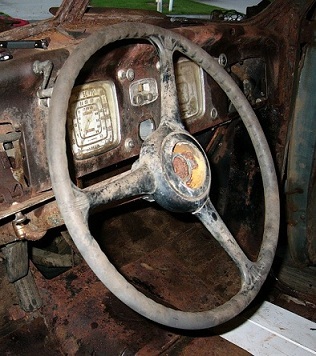 Still waiting on the dash gauge refurb in Oregon. 21 July 2011 I've driven the car to work a number of times now and Reliability is there. No leaks. It starts quickly with the push of the button. I've driven it to pick up chinese take-out, to the grocery store, to the upholstery shop a couple of times, the lumber yard, and to a local car show last week. It's actually like having a second car now. I...LIKE...it. 15 Sept 2011 Completed the rear arm rests. The driver side had to be completely rebuilt, and the other one repaired, but both are reassembled, Amos has recovered them and they fit just fine. 5 Dec 2011 Built new interior side pillar panels from scratch. Found the exact same type and thickness of panel board, and drilled the holes for the pass through nails. I then recessed the areas around the nail heads just like the original panels. I was able to obtain a few remaining NOS nails and trap washers for the back, from a place in PA, to recreate the original installation. 5 Feb 2012 Got the headliner installed. It was tight, barely fit, but did go in and looks fine. More to do with tidying up the windlace and hidem. Created new panel to go below rear quarter windows and above the rear arm rests, and they are in place. The front door armrests have been rebuilt, recovered and reinstalled. 2 Mar 2012 The headliner is now finished up, all hidem is in place, and windlace. I had new windlace made from coordinating fabric, to avoid using the modern-looking windlace used in later cars. Also installed the new panel between the trunk and rear seat back. 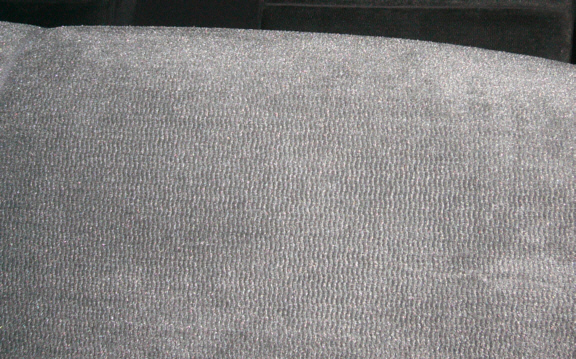 Carpeting has been installed in the rear floorboard and under the front seat. The rebuilt footrest has been recovered and installed.